Samsung Rewards is an always-on loyalty program/platform enabling consideration and adoption between consumers and Samsung. Samsung Pay, Samsung Health, Samsung Internet, and Bixby users can earn points for their loyalty and redeem them for a variety of catalog items. 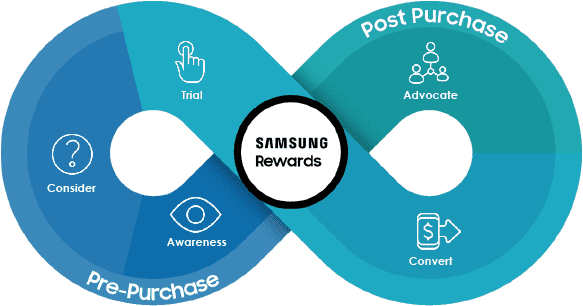 Samsung Rewards helps Samsung and the partners acquire and retain customers at every step of the user journey. From pre-purchase to post-purchase, strategies are put in place to build awareness and advocate a successful loyalty program. This always-on retention program offers consumers a compelling value proposition in exchange for incremental usage. Every time a user makes a purchase with Samsung Pay, completes certain actions in Samsung Health or Samsung Internet, or interacts with Bixby in certain ways, he or she is awarded points. Samsung Rewards points earned can then be redeemed for catalog items. Earn points with every qualifying purchase made with Samsung Pay—plus, get the opportunity to boost your earning each month. Earn points from purchases made in the Shop Samsung app. Just look for the Samsung Rewards icon next to the product to see how many points you’ll get. Earn points for setting Samsung Internet as your default browser—our best performing browser yet. Earn points by participating in Bixby promotions. Look out for regular promotions that can help you earn even more points. Users can visit Samsung Pay to see and redeem full categories of catalog items that include Samsung products, coupon codes and the Chance to Win game. Users can sign in to SamsungRewards.com to check their Samsung Rewards point balance and easily redeem their rewards earned for available merchandise. Samsung Rewards is a member-focused program that drives consumers to choose Samsung and achieve more possibilities through services and the latest products. Partners and developers can grow their business by promoting their product or service to Samsung customers with Samsung Rewards points. Send an email to Team.Rewards@Samsung.com to learn more about the opportunities to partner with Samsung Rewards.